246 pages | 100 B/W Illus. Documentary Editing offers clear and detailed strategies for tackling every stage of the documentary editing process, from organizing raw footage and building select reels to fine cutting and final export. Written by a Sundance award- winning documentary editor with a dozen features to his credit and containing examples from over 100 films, this book presents a step-by-step guide for how to turn seemingly shapeless footage into focused scenes, and how to craft a structure for a documentary of any length. The book contains insights and examples from seven of America’s top documentary editors, including Geoffrey Richman (The Cove, Sicko), Kate Amend (The Keepers, Into the Arms of Strangers), and Mary Lampson (Harlan County U.S.A.), and a companion website contains easy-to-follow video tutorials. "Anyone involved in the intellectually-challenging and labor-intensive work of documentary editing will find this book an essential companion. Whether you are a novice editor or an experienced hand, Bricca's unwavering faith in the process of editing will guide you securely down the bumpy road to the finished film." 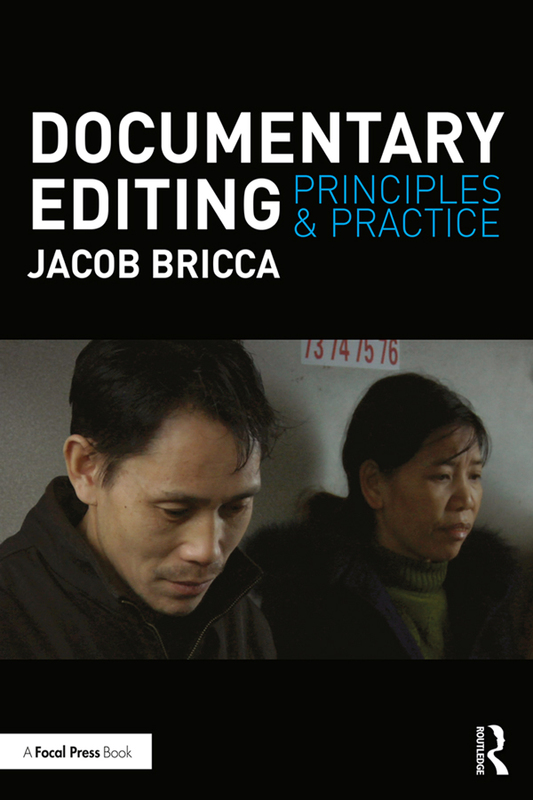 "Jacob Bricca’s Documentary Editing is a critical addition to the documentary filmmaker, editor, or professor’s collection. In fifteen years of filmmaking and teaching I have not come across such a straight-forward, cohesive, and useful manual for how to tackle that most daunting of challenges: editing the documentary film." "The book finishes up with an analysis of four films, two feature length and two short. Along the way a multitude of other narrative documentaries are discussed and analyzed. Bricca's writing is clear and focused." There is much to recommend in this book for teaching in film production classes, but as a writer I found that certain elements could be applied to my own editing in words, rather than pictures. Ultimately, Bricca unravels the complexity of editing, demystifying the art of storytelling in the process." —Cynthia Close, Documentary Magazine, Fall 2018; "Reality Ink: The Zen of Editing: A Primer"
Documentary Schedules: How Many Weeks? Build Up or Trim Down: Two Options for Finding "The Good Bits"
Why Hold a Rough Cut Screening? Jacob Bricca, ACE is an Associate Professor at the University of Arizona's School of Theatre, Film and Television, where he teaches classes on editing and documentary filmmaking. A member of the American Cinema Editors, he has edited over a dozen feature films, including the international theatrical hit Lost In La Mancha, the New Yorker Films theatrical release Con Artist, the Independent Lens Audience Award Winner Jimmy Scott: If You Only Knew, and the Sundance Special Jury Prize winner The Bad Kids. His directing credits includePure, which screened at the 2008 Berlin International Film Festival, and Finding Tatanka, which premiered at the 2014 Big Sky Documentary Film Festival.